Benefit from the SEMIKUBE experience and discover the new SEMIKRON SlimLine platform. Powerful, compact, precise, long lifetime – these are the attributes of the SEMIKUBE SlimLine. SEMIKUBE SlimLine platform has been designed to fit applications in severe environments. Suitable for outdoor cabinets, the platform can be placed in environments subject to high temperature fluctuations. 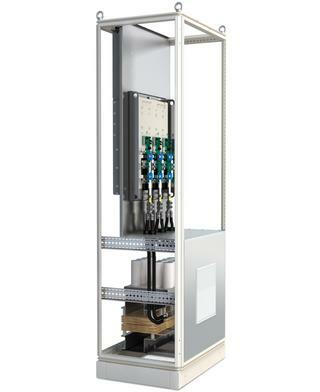 Extremely slim, the platform can be mounted into 300mm deep cabinets. The platform design facilitates cabinetintegration owing to the separation of the main cooling air flow through the heatsink and its IP54 rated mounting flange. Extending the SEMIKUBE portfolio, the SEMIKUBE SlimLine platform is able to integrate , thanks to its optimized layout, state of the art hybrid SiC and full SiC module. This family of pre-qualified power assemblies follow the same rigorous SEMIKRON qualification and certifications. The platform integrates advanced technologies which maximize performance and power density. 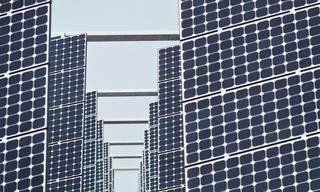 SEMIKUBE SlimLine is optimized for solar central inverters. 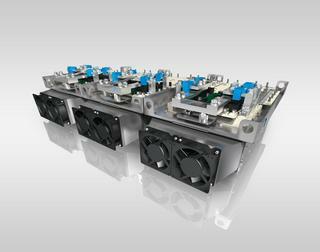 Designed for the most commonly used central inverter ratings on the market, i.e. 500kW, 670kW to as high as 900kW, the SEMIKUBE SlimLine 3-phase inverter operates up to 1000VDC bus voltage with 1200V modules, and 1200VDC bus voltage with 1700V power modules. Designed in accordance with IEC 62109, this platform is poised to obtain UL 1000V recognition. 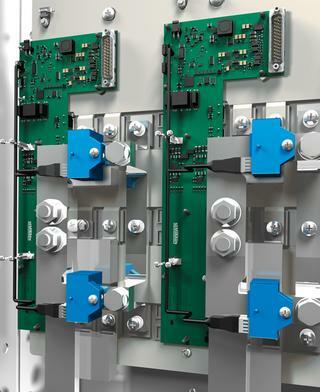 SEMIKUBE SlimLine complies with most AC Drives application requirements, offering typical electrical topologies including controlled or uncontrolled rectifier, an IGBT inverter and a brake chopper. 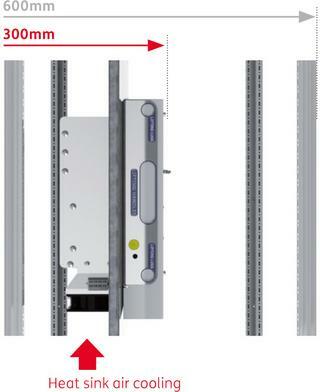 The new slimmer frame design, with front access for the power connections, simplifies integration of the electrical power distribution arrangement inside the cabinet. The current measurement precision of 1% (at 25°C) allows for premium motor control required for highly dynamic applications and motion control systems. The SEMIKUBE SlimLine offers four frame sizes of continuous rated current from 150A to 1500A, using SEMITRANS 1200V and 1700V IGBT Trench E4 modules. Hybrid SiC module version is also available for SL20. The IGBTs are controlled by a SEMIKRON embedded driver, which provides gate signals, control and error management, as well as analogue measurements of current, DC voltage and heatsink temperature. A CAN interface is available for parameter configuration and diagnostics monitoring. Custom factory settings to meet specific application requirements can also be set via the CAN interface during manufacture. Air cooling for SEMIKUBE SlimLine is provided by highly efficient long life axial fans, realizing maximum power within a compact package.